Significant gains against malaria could be lost because funding for insecticide-treated bednets has dropped, and malaria parasites appear to be developing resistance to the pharmaceuticals used to clear the disease from humans, while insects that transmit the parasites develop resistance to insecticides used to hold their populations down. UN’s World Health Organization (WHO) published its annual report on the fight against malaria last month, December 2012. Accompanying the many page World Malaria Report 2012 were a press release and a FAQ; the fact-sheet appears unedited below. Generally, the report is good news. Dramatic facts emerge from the report: The “million-a-year” death toll from malaria has been whacked to fewer than 700,000, the lowest level in recorded human history. More people may die, and soon, if aid does not come to replace worn bednets, distribute new ones, and if the drugs that cure the disease in humans, lose effectiveness. Many nations where the disease is endemic cannot afford to wage the fight on their own. Links in the Fact Sheet were added here, and do not come from the original report — except for the link to the WHO site itself. According to the latest WHO estimates, there were about 219 million cases of malaria in 2010 and an estimated 660,000 deaths. Africa is the most affected continent: about 90% of all malaria deaths occur there. Malaria remains inextricably linked with poverty. The highest malaria mortality rates are being seen in countries that have the highest rates of extreme poverty (proportion of population living on less than US$1.25 per day). The six highest burden countries in the WHO African region (in order of estimated number of cases) are: Nigeria, Democratic Republic of the Congo, United Republic of Tanzania, Uganda, Mozambique and Cote d’Ivoire. These six countries account for an estimated 103 million (or 47%) of malaria cases. In South East Asia, the second most affected region in the world, India has the highest malaria burden (with an estimated 24 million cases per year), followed by Indonesia and Myanmar. 50 countries are on track to reduce their malaria case incidence rates by 75%, in line with World Health Assembly and Roll Back Malaria targets for 2015. These 50 countries only account for 3% (7 million) of the total estimated malaria cases. This year, the World Malaria Report 2012 publishes country-based malaria case and mortality estimates (see Annex 6A). The next update on global and regional burden estimates will be issued in December 2013. To achieve universal access to long-lasting insecticidal nets (LLINs), 780 million people at risk would need to have access to LLINs in sub-Saharan Africa, and approximately 150 million bed nets would need to be delivered each year. The number of LLINs delivered to endemic countries in sub-Saharan Africa dropped from a peak of 145 million in 2010 to an estimated 66 million in 2012. This will not be enough to fully replace the LLINs delivered 3 years earlier, indicating that total bed net coverage will decrease unless there is a massive scale-up in 2013. A decrease in LLIN coverage is likely to lead to major resurgences in the disease. In 2011, 153 million people were protected by indoor residual spraying (IRS) around the world, or 5% of the total global population at risk. In the WHO African Region, 77 million people, or 11% of the population at risk were protected through IRS in 2011. The number of rapid diagnostic tests delivered to endemic countries increased dramatically from 88 million in 2010 to 155 million in 2011. This was complemented by a significant improvement in the quality of tests over time. In 2011, 278 million courses of artemisinin-based combination therapies (ACTs) were procured by the public and private sectors in endemic countries – up from 182 million in 2010, and just 11 million in 2005. ACTs are recommended as the first-line treatment for malaria caused by Plasmodium falciparum, the most deadly Plasmodium species that infects humans. This increase was largely driven by the scale-up of subsidized ACTs in the private sector through the AMFm initiative, managed by the Global Fund to Fight AIDS, Tuberculosis and Malaria. Antimalarial drug resistance is a major concern for the global effort to control malaria. P. falciparum resistance to artemisinins has been detected in four countries in South East Asia: in Cambodia, Myanmar, Thailand and Viet Nam. There is an urgent need to expand containment efforts in affected countries. For now, ACTs remain highly effective in almost all settings, so long as the partner drug in the combination is locally effective. Mosquito resistance to at least one insecticide used for malaria control has been identified in 64 countries around the world. In May 2012, WHO and the Roll Back Malaria Partnership released the Global Plan for Insecticide Resistance Management in malaria vectors, a five-pillar strategy for managing the threat of insecticide resistance. You were perceptive. You noted there is no call from malaria fighters for more DDT, nor for any change in DDT policy. This is a report from medical personnel, from public health experts, the real malaria fighters. It’s not a political screed. This entry was posted on Friday, January 4th, 2013 at 8:04 am and is filed under Africa, History, Hoaxes, Malaria, medicine, Public health, Science. You can follow any responses to this entry through the RSS 2.0 feed. You can leave a response, or trackback from your own site. Then put screens on windows. That was part of the magic we used in the U.S. to defeat malaria by 1939 — but we had to upgrade houses to that the windows were the last holes through which mosquitoes could fly. Screened windows work better than bed nets, if the rest of the house is quite mosquito-tight. 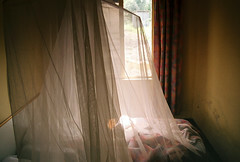 In those areas where window screens are pointless, bednets work well — even with less than 100% use, they are more effective in preventing malaria than DDT. The key is to reduce human-mosquito interaction in those hours of the evening to very early morning during which malaria-carrying mosquitoes are active and biting. Every small step helps: Drain the rain gutters, empty the old tires, fill int the potholes in the road . . . mosquitoes do not generally move more than about 50 yards in a lifetime. Keep the mosquitoes away from humans, bites occur much less often. Block mosquitoes from human habitation at night, with window screens or bednets, much malaria is prevented. If it works, do it.